It is quick. The surgical procedure lasts from half an hour to an hour on average and is performed under local anesthesia. 2 weeks after the plastics, the swelling comes off and the ears acquire a permanent beautiful shape. It is safe. This is a simple plastic surgery, which has a minimum effect on the body. If otoplasty is performed by a highly qualified surgeon, and the patient follows all the recommendations during the postoperative period, the result will be guaranteed to be successful. It is aesthetically pleasant. Visible new contour (auricles, lobes, anthelion, etc.) appears immediately after the plasty. The full face acquires proportions and symmetry. An important aspect of otoplasty is the observance of the postoperative regimen. During this period, much depends on the discipline of the patient, who should fulfill all the appointments of the observing specialist. Before the operation it is necessary to learn about all the pitfalls that can spoil the aesthetic effect. In case of the perfect health, the patient can leave the clinic after 1-2 hours. At the request or recommendation of the surgeon it is possible to stay in the hospital for the first day - it may be performed in order to observe and receive recommendations for the rehabilitation period. The final stage of otoplasty is the application of a fixative bandage. It retains a layer of cotton wool soaked in mineral oil to eliminate swelling more quickly. And the main function of the bandage is to press the ears in their new position and protect them from mechanical injuries. A plaster is being applied onto the seam, which protects it from possible contaminants. 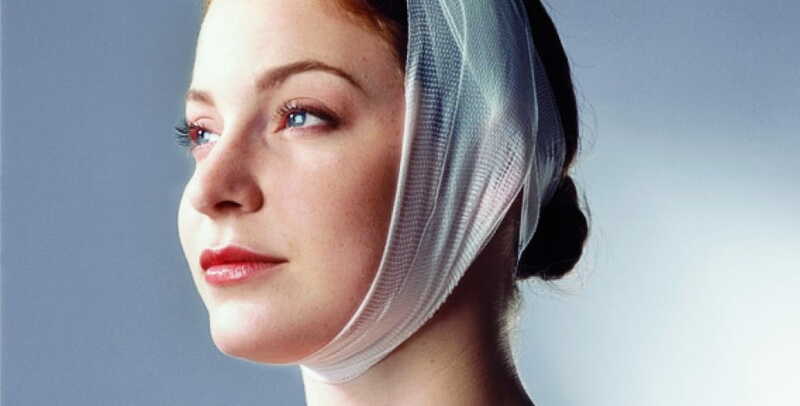 The final stage of plasty is application of the tennis elastic band or kerchief. It is necessary to wear a fixative bandage from a week to two weeks. A day after the plastic surgery, the first bandaging is performed. The patient also receives recommendations for taking medications for an accelerated healing process. The procedure is repeated in 3-4 days. After the postoperative week, the patient visits the clinic to remove and inspect the sutures. When will the result of the ears' plasty be visible? A noticeable result appears immediately after the completion of otoplasty. However, there is a process of active healing during the first week, which is accompanied by swelling of the tissues. That means that there are bruises, redness and swelling in the operated area, which makes the contour blurred. A more accurate form appears after 2 weeks on average. And the final result is obtained not earlier than two months later. What affects the result of otoplasty? You should not wear glasses in the first 1-2 months (even a very light and comfortable frame can deform tissues that are still soft). If the patient adheres to all rules of the postoperative period, then the effect will be the most aesthetic one, and there will be no traces of the sutures. In case of violation of discipline, there may be ruptures as well as appearance of visible scars or deformation of the cartilaginous tissue or skin are possible. In order to avoid repeated correction, we recommend that you follow all the surgeon's prescriptions.